I am just getting started in my fourth semester of law school. Thus far I have taken 15 classes and I am in the process of taking 5 more. Throughout all my classes, I have had some favorites and some that I did not enjoy. I am going to touch on the highlights of both for the 1L core classes everyone has to take. 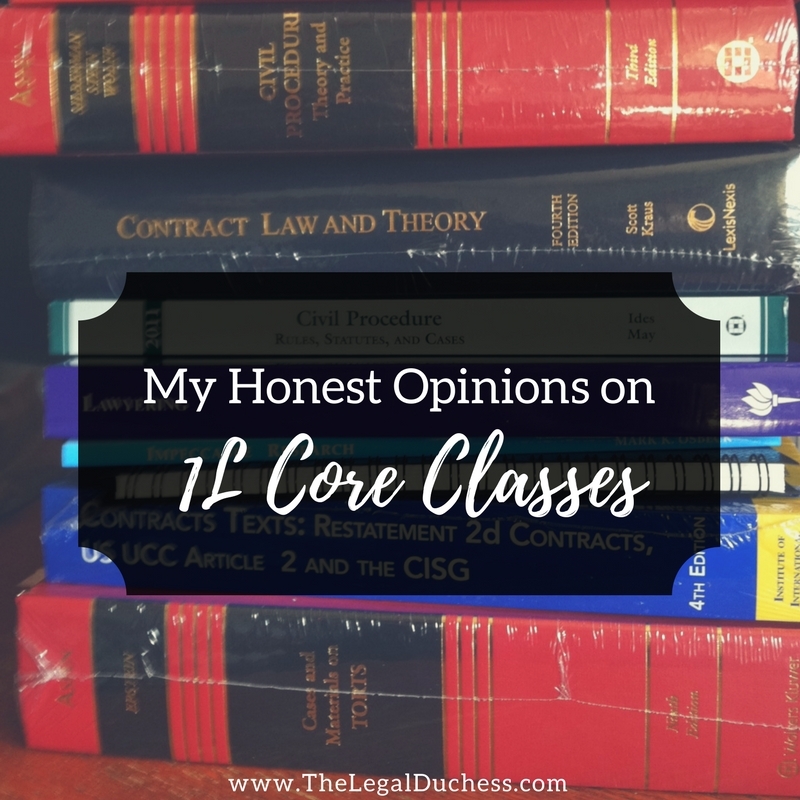 While everyone is different and enjoys different classes or concepts, my hope in doing this is to just give a little more insight into what law school classes are actually like: the good, bad and ugly. I took Contracts in two installments 1L year. Overall, I found Contracts to be extraordinarily boring. I felt like it was mathematical... a good contract requires filling in a formula of sorts. You have a formula of law to create a contract and a formula of law to breach one. Though this made the class relatively easy for me and I did very well, it just wasn't my cup of tea. I have never been a math person and I think that is why contracts didn't click with me either. For others in my class, they loved the formality of contacts. I think it is a class you either love or hate. Oh Property... it's a love/hate relationship. This was another class I took in two installments 1L year. I LOVED some parts of Property law... I loved how historical it is and how the law has changed little in hundreds of years. It is precedent based. It brought out my inner history nerd. I also loved how it is so applicable to real life- as a homeowner, I could relate to Property law because I had used it. However, some concepts just blew my mind and I could never quite grasp them (and yes I am talking about Estates and Future Interests... and mortgages...). Though I genuinely enjoyed Property law class, I found studying for and taking Property exams to be some of my biggest challenges 1L year. I took Torts my very first semester and it was my highest grade first semester. I LOVED Torts. I think it is such a fun class. The concepts are conceivable- we have all heard that if you slip in a store, you could recover damages. You can wrap your head around the laws easily. The cases can be so ridiculous they are hilarious- one I always remember is a claim by a woman that her car trunk should have had a release from the inside because when she locked herself in the trunk of her car to commit suicide and it didn't work because the trunk wasn't airtight, she should have been able to get out on her own; instead she was in there for 5 days until someone opened the trunk by happenstance (she lost because it was decided that suicide was not the intended purpose of a car trunk). The utter ridiculousness of this case makes it impossible for me to forget, along with the accompanying Tort law concepts. I love Torts so much that I asked to be a part of the Products Liability Moot Court Team when given the option. Civil Procedure is a great first-year class because it involves cold, hard, black letter law rules. There is no guessing and arguing- there are just rules. Though this made it a great class to learn in and was easier to study for than some others, it also felt a bit stale and stifling at times. I had a great professor who made it as fun as legal rules can be but it still is just very stale. I know that it is a very important class for those who want to go into civil litigation and trial work and if that is your focus, I suggest making Civil Procedure a priority! Con Law is a very important class. I know not everyone will agree with me but I truly believe it is. The Constitution is the basis of our country and its legal system. As aspiring attorneys, the legal system is going to be our bread and butter. Knowing where the laws came from, why they came to be and how they came to be may not always be fun but it is integral. Con law seeps into all other classes because a constitutional issue will inevitably pop up in every other law class. I always felt there was something extra important about learning the law of our country through the frame of our constitution... it is just so important as an American. I also enjoyed the historical aspect because I am and will always be a self-professed history nerd. Crim law is my absolute favorite. I have always said I wanted to go into criminal law but I really didn't what that entailed until taking this class in the spring of my 1L year. Two weeks in and I knew this was the only law I wanted to practice. I just love the challenge each case presents- you need to find out the truth of the case and fit it into the elemental boxes of a crime and then argue for or against conviction. My professor taught us criminal law by assigning us defense or prosecution and letting us argue our way through class according to the statutory provisions and facts of a case. I just loved every minute in that class. Criminal law is unique because you are applying statute to facts to determine if there is a crime or not. It is a bit different than other classes that have laws based more on the decisions of precedent cases and the common law system. After finishing Criminal Law, I knew this was the field for me... and it was my highest grade in law school to date which certainly made me happy. Legal research and writing is such an important class. It is truly hands-on and simulates what you will do in practice as an attorney. However, it is also technical and at times very frustrating... and it is easy to put on the backburner during the hustle and bustle of 1L year. By the end, I wanted nothing more than to burn my bluebook. I did really well with the appellate brief because it was persuasive writing. But I struggled with objective writing for the memorandum. A lot of the things they made us do in LRW just felt like busy work... I never want to hear the words "Core Grammar" again. But all of that aside, I did learn to be a better legal writer and when I went to my internship after 1L summer, I was armed with a group of skills to complete any research or writing assignments they gave me. So no matter how annoying and boring it was, legal research and writing is so very necessary and a class that should be taken very seriously. 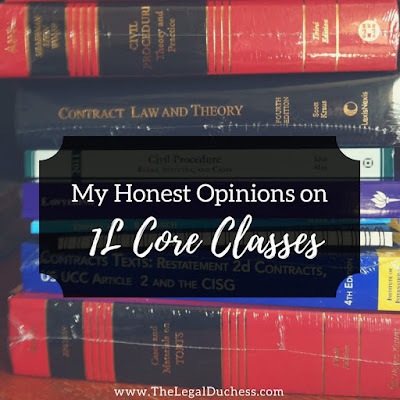 Well, there they are: my very honest opinions and thoughts about 1L classes. I know everyone is different and has very different opinions about which classes they enjoy and which they hate. I just hope this helps to give some insight into what to expect in these classes so you can go into 1L year with some understanding of what to anticipate. Also, I am happy to have no classes today in honor of Martin Luther King, Jr. day but I want to take a moment to remember why we have no classes. Today we honor a man who worked tirelessly for justice, equality and rights for all- the three things I think lawyers should strive to protect and uphold. Today, I remember a great man with a dream for freedom and I will work extra hard toward my own dreams so that someday, my license to practice law can help me to provide justice, equality, and protection of the rights of my fellow citizens.